Here’s a different angle on why finished military apartments are unoccupied. 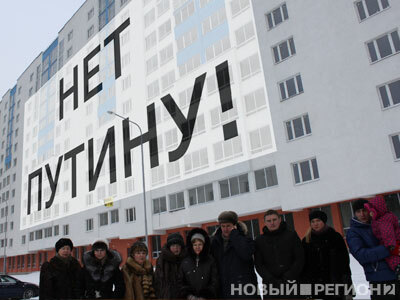 Last week Novyy region told the story of how apartments for military men in Yekaterinburg got tangled up with apartments for private buyers, leaving the latter standing in front of a huge sign saying “No to Putin!” and vowing not to vote for him on March 4. The tale goes like this. In 2005, the Defense Ministry engaged the Megapolis construction-investment company to build a 254-unit apartment building for military unit 61207, which looks to be a nearby Railroad Troops brigade. The building was supposed to be ready in 2008, but construction dragged out, reportedly as a result of rising costs. To complete its work, Megapolis said it needed to sell some of the apartments which it did. These civilian owners, however, have keys to apartments they can’t occupy. This scenario of Defense Ministry contractors selling some apartments on the open market has produced similar confrontations in several cities. No word on how the servicemen are faring in the wait for their apartments. Presumably they’ve remained in whatever service housing they had, and can’t be dismissed until they take delivery of their apartments. This entry was posted in Military Housing, Officer Corps, Railroad Troops, Serdyukov's Reforms and tagged apartments, Election, Vladimir Putin. Bookmark the permalink.